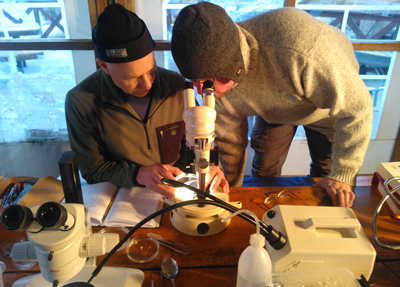 Sampling nudibranchs in the outer part of the Sognefjorden at Gulen, has been a priority mid-March the last four years. This year it turned out to be very productive. More than 50 species were found providing specimens to or research on nudibranchs. This year we had the pleasure to meet Bernard Picton and work with him at Gulen. This will certainly extend our nudibranch project with collaboration with Bernard, firstly with species of the genus Flabellina. The major aim of the sampling trip to Gulen is to collect specimens for our DNA barcoding project on Norwegian nudibranchs. Scuba diving has been an important tool in the nudibranch project my friend and colleague Jussi Evertsen and I have been running since 1997. The last five years’ focus has been to collect fresh specimens to build a DNA barcoding library for species found in coastal Norwegian waters. We have been sampling at Gulen in March every year the last four years. An increasing number of species have been found and it has been very important for our project. The locality at the Gulen Dive Resort is special. A vast amount of different habitats are found within swimming distance, literally, from the pier. Of the 90 recorded nudibranch species in Norway we have found more than 50 from this locality alone. What has been a great success finding such a high number of species is collaboration with underwater photographers. We owe a great thank to underwater photographers keen on observing and photographing nudibranchs. They are eager to learn about the group as such and the different species we find. We also owe thanks to fellow marine biologists and other participants in the “Nudibranch Safari” the last four years. Christian Skauge and the hosts at Gulen Monica Bakkeli and Ørjan Sandnes have been tremendous in hosting and providing help in our work at Gulen. During this year’s field trip we had a closer look at the different species of Flabellina we find. DNA barcoding indicate that we have three different species of F. lineata, and we have been wondering if the species known from British waters F. browni are present. With Bernard Picton we could sit down and compare specimens representing different species. The whole evening in the microscope discussing characters we concluded that this was really interesting and more work is needed. Time consuming taxonomic work that involves studying type specimens and compare them to those we sampled. We did not find F. browni, it has not been found in Norway so far. The three different F. lineata is really interesting, but we also had one more species. What could this be?